Above/below : Children's Holiday Venture participants learning backwoods cooking skills. A distinct absence of campers this weekend, except for the usual local Scouts who seem to be completely unaffected by cold weather or hardship. 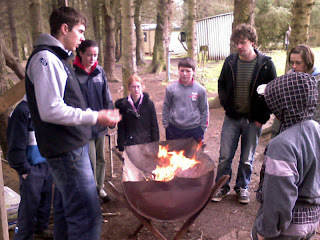 Both accomodation buildings were fully booked though, which kept everyone busy on the activity front. A Boys' Brigade group were staying in the Henderson Building, whilst the Children's Holiday Venture from Edinburgh were in the Richmond Chalet. The CHV have been long-term users of the centre and are a charity which is run entirely by students from Edinburgh University. 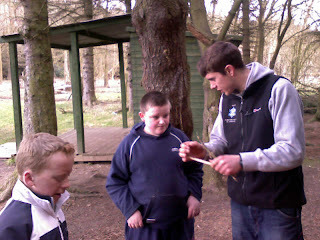 They provide a range of social events for children from deprived areas, and have held camps at Fordell for many years. Saturday was fairly busy with numerous on-site activities; the BB's trying out the new BMX skills course and inflatable gladiators/sumo, while the CHV took part in archery and crate climbing. This was the first time some of the children had tried these activities and they had a great time, the crates in particular proving popular. Above : The birthday BBQ was going splendidly until Mr Rain decided to gatecrash. 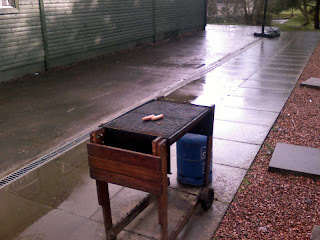 Luckily the 2 stranded sausages were rescued by the staff. The lack of campers gave the staff the luxury of having a night off from having to clean the toilets, and an extra half-hour of relaxation in the staffhut. Onto sunday and a few day visits kept things busy with two kids birthday parties. One of them braved the weather for a barbeque next to the wet weather hall, which went well until the weather forced everyone to flee. Luckily for the staff though, they forgot to take their sausages and rolls with them, so the evening meal problem was swiftly solved. 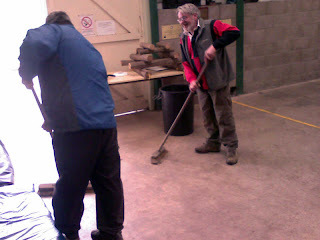 Above : Bob and Henry practice for the World Curling Championships. In between and after activities, a few other projects were worked on - Fordell's own ginger 'Stig' went up to the quad track to try to get some helmet-cam footage, which was moderately successful after a number of technical difficulties. After learning not to unplug the video cable during the run, the Stig and team managed to get some reasonable footage of a flying lap which will appear on the blog shortly (after certain file conversion problems have been overcome...). 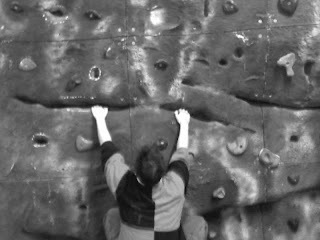 Later in the evening, a few of the staff who had no homes to go to had an enjoyable session on the new(ish) bouldering wall in the wet weather hall, trying to make up a range of new bouldering routes. After a couple of hours of hard grafting, a range of routes were created ranging from easy to impossible, and an official guide shall no doubt be made up shortly before groups start using the facility.